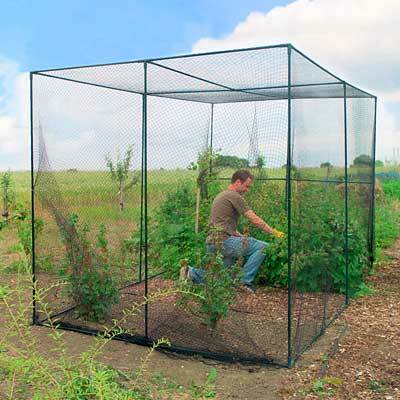 Protect your peppers, tomatoes, and blueberries from damage by animals with the Gardman Walk-In Fruit Cage. This full system keeps deer, birds, and other animals from your fruit and vegetable plants, while allowing you easy access to it. The sturdy, powder coated black steel frame surrounds a few plants, and the included woven mesh netting drapes over the frame. The 1.25" long openings on this net allow plenty of air, water, and sunlight to reach your plants, and a 75" tall, zippered opening enables you to enter the cage to tend to your vegetables. Secure the net to the frame with the included zip ties for lasting protection. The push-fit joints are simple to assemble and maintain, and the included ground pegs keep the cage in place all season. The item can also be disassembled with ease, for tidy storage when not in use. The steel frame is perfect for use in harsh weather, and its significant, 76" height is designed for larger shrubs and tall plants. Enjoy the fruits and vegetables you have grown instead of wildlife stealing it with this Walk-In Fruit Cage. Assembly required.